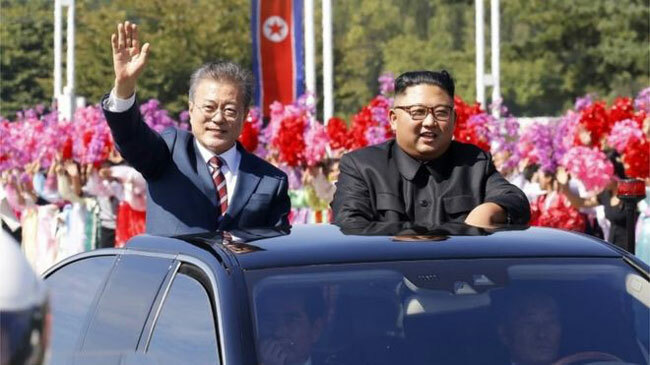 Two Korean leaders met in the North Korean capital for talks on nuclear war in the Korean Peninsula. North Korea is currently engaged in talks with South Korea and the United States this year. South Korean President Jay J and his wife arrived in the North Korean capital Pyongyang yesterday morning. They were welcomed by North Korean leader Kim Jong Me and his wife Amogo. This is the first time South Korean President has been to North Korea in the last ten years. This is the 3rd meeting of South Korean President Moon J's with North Korean President Kim Jong You, starting from the historic meeting on the border between the two countries in April this year. With the end of the Korean War with the ceasefire in 1953, no peace treaty has been reached. The leaders of both countries are expected to negotiate on the procedure for nuclear elimination. But the details are not known.